Joshua Stuart, associate professor of biomolecular engineering, and graduate students Stephen Benz and Zack Sanborn are key members of the UCSC team involved in The Cancer Genome Atlas project. Photo by B. Wagman. The TCGA project was highlighted in a White House announcement this week of $5 billion in grants to fund cutting-edge medical research across the country as part of the economic stimulus package. The TCGA project aims to collect more than 20,000 tissue samples from more than 20 types of cancer, and determine in detail all of the genetic changes in these tumor samples. David Haussler, professor of biomolecular engineering, leads a group of bioinformatics experts in the Baskin School of Engineering who were involved in the TCGA pilot project, which was designed to assess the feasibility of the large-scale effort now getting under way. The UCSC group will collaborate with clinical partners at the Buck Institute for Age Research in Novato to establish the Cancer Genome Data Analysis Center. "Our role is to develop the technology to read in all the data from TCGA and analyze it to determine which information is useful for designing better treatment strategies," said Haussler, who directs UCSC's Center for Biomolecular Science and Engineering. "We're not just looking at one or two genes; we get millions of data points for every tumor. That's unprecedented, and we need enormous computer power to handle that." TCGA was awarded $175 million in American Recovery and Reinvestment Act funds, plus $50 million each from NCI and NHGRI. The UCSC-Buck Institute center will receive $5.6 million in funding over five years from NCI. 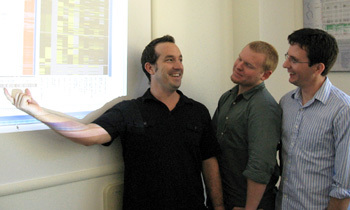 Haussler's bioinformatics team created and maintains the widely used UCSC Genome Browser. More recently, they developed a Cancer Genomics Browser designed to help researchers find patterns in large sets of clinical and genomic data from cancer studies. "What's unique at UCSC is that we are able to use our Genome Browser format to build a platform for cancer genome informatics," Haussler said. "We are bringing all of our genomics prowess to bear on this new area of research, and we've been able to leverage the talents and infrastructure already established at UCSC." TCGA is a comprehensive effort to map the genomic changes that occur in major types and subtypes of cancer. In all types of cancer, glitches in a cell's complete set of DNA, or genome, lead to uncontrolled cell growth. The comprehensive maps created by TCGA will show what is wrong in the genome of each type of cancer. This information, which will be rapidly deposited into public databases for use by the worldwide research community, will accelerate efforts to find better ways of diagnosing, treating, and preventing cancer. "We hope that the information we learn will ultimately be used to design individualized treatments for cancer patients," Haussler said. "Every tumor is different, and that's what makes cancer such a difficult disease to treat. The big challenge is to work out which combinations of drugs are most effective for individual patients." More than a dozen researchers are involved in the Cancer Genome Data Analysis Center. In addition to Haussler, they include Joshua Stuart, associate professor of biomolecular engineering at UCSC; Christopher Benz, M.D., a program director at the Buck Institute and adjunct professor of medicine at UCSF; UCSC graduate students Stephen Benz, Zack Sanborn, and Chris Szeto; and UCSC postdoctoral researchers Jing Zhu and Ting Wang.